First off, let me get one item of business out of the way: I have never played the titular Max Payne video game. While the advertisements made it look cool (albeit highly derivative) in a Matrix– meets – Hard Boiled sort of way, my gaming time was budgeted for blasting the Covenant forces of the Halo universe. Therefore, the newly released Max Payne movie has to stand on its own merits, of which any redeeming ones I have yet to think of. The film’s trailer was well produced and displayed some tantalizing action sequences, but as is all too common these days, if you’ve seen the trailer you’ve seen all the best parts of the movie. Turn your computer speakers up quite high, watch the trailer while setting a $10 bill on fire and you get pretty much the full experience of watching Max Payne in a theater. Second item of business: I consider myself a fairly well versed fan of the action genre. 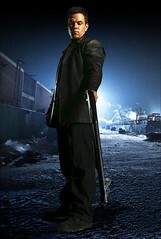 However, one of the problems with watching a lot of action movies over the years is that while watching a new release, I can’t help but think that I could have made a better movie myself (case in point, 2004’s The Punisher), or that the genre is becoming so incredibly clichéd and formulaic that it’s time for a complete re-imagining of the genre. On the other hand, my wife (who is far from an action movie aficionado) was gracious enough to see Max Payne with me and enjoyed it in spite of its derivative nature. 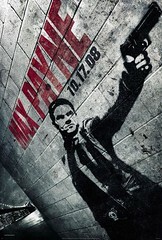 Max Payne is one of the worst offenders when it comes to lifeless and unimaginative action movies. It ticks every single action movie cliché and rips off stylistic elements from seemingly as many other films as it possibly can. Corny flashbacks in bright sunny colors: check. Payback/Sin City color scheme and snow: check. Loner antihero protagonist with a grim expression who never eats, sleeps, drinks, or smiles, fending off hordes of heavily-armed enemies with a measly pistol: check. This wouldn’t all be so atrocious except for the fact that the movie takes itself so seriously, and not in a Hot Fuzz sort of way either. It’s another tired revenge story that got wrapped up in layers of lame mythological references and corporate conspiracy plots. A loving father (who happens to be a cop/federal agent/soldier/etc.) loses wife and child, turns rogue and exacts revenge on the evildoers. How many times has this movie been made? Mark Wahlberg has the ability to put out decent work, whether as an actor in films like The Departed or as the producer of Entourage. He reportedly took enough interest in this script, without previously playing the video game, to get on board. But after seeing the end result, I have to wonder if he’s having second thoughts. Why successful actors allow their brand or image to be diluted by movies such as Max Payne is beyond the scope of this article. Mila Kunis shows up as a stock Russian assassin with a penchant for black leather, spiky heels and German submachine guns (again, all clichés). She does as well as can be expected with the material she was handed, and if she can use this role to put That ‘70s Show behind her, so much the better for her career. On a side note, her addict sister Natasha is played by future Bond-girl Olga Kurylenko, who’s previous film was the equally by-the-numbers video game turned movie Hitman. 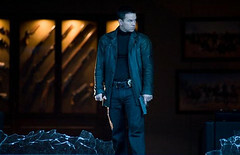 After a tepid opening action sequence, the film takes an hour to really get boiling. When it does it is so laden with CGI that any visual subtlety is lost and the story becomes bogged down by its own focus on the “Valkyr” drug conspiracy plot. Logical loopholes permeate the plot, and it tries far too hard to incorporate pseudo-supernatural elements and references to Norse mythology. 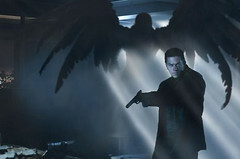 The more the script focuses on the fictional drug’s side effects and the resulting preposterous mass hallucinations of exactly the same type of CGI demon-Valkyrie, the more ridiculous the movie becomes. Movies exist in part to distract the viewers from reality and keep their attention for long enough to become immersed in an alternate world, and hopefully make the audience ponder some larger narrative theme. The unfortunate thing about a film like Max Payne is that it is so vacuous, so devoid of any greater purpose or theme except for nihilistic revenge, that it is completely worthless for entertainment value. Stylized violence only engages a viewer for so long; there must be something more substantive to make a movie worth spending one’s time or money to see it. About reviewer Elliot Strong: I am a man of eclectic tastes. Born and raised in Seattle, my interests range from opera and Walla Walla wine to vehicles with loud engines and movies with explosions in them. My taste in movies is just as questionable and far-ranging as you may suspect. Currently living and working in Ballard with my wife, Daytona, and a big weird cat named Max, I am sort of boring and have been at Mars Hill since 2001.